I know there's a lot of talk about eating locally and in season when possible. And with tomatoes, it seems to be doubly important. I fully blame those watery, even sour, near-white-in-the-center grocery tomatoes for the number of people who claim to hate them. So usually I forgo tomato recipes during the winter unless I can use the canned variety. 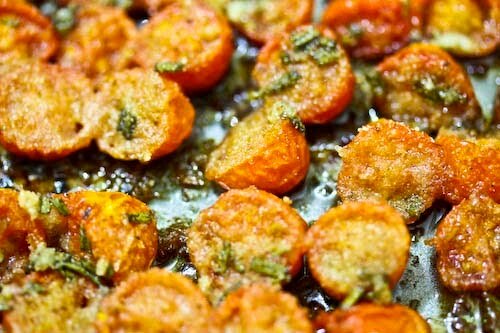 But if you need a fix, and you find a couple of pints of beautiful little cherry tomatoes, roasting them in the oven with a shower of olive oil, garlic and bread crumbs will, I promise you, bring them to life. Even if it's horrible and snowing and gray outside. And if it is snowing and horrible and gray outside, and you're stuck inside, say, with not a lot to do, and you feel like fussing around A Lot with your cherry tomatoes, this is the dish for you. The steps are easy, the ingredients common. The method? A little bit of a pain. But not that much. Not with some music on in the background and a chair pulled up to the table. Just embrace slicing through all of those tomatoes and methodically arranging them cut-side up in a single layer on the bottom of your pan. Whisk together the olive oil, garlic, rosemary, salt and pepper in a bowl. Preheat the oven to 350F. Get comfortable and cut the tomatoes in half crosswise. Place them together tightly, cut-side up in one layer on the bottom of a 17"x 11" (9"x 13" will also work). 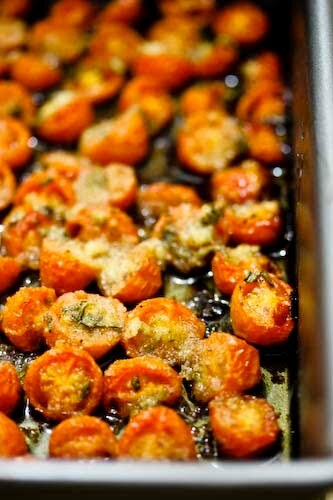 Spoon the olive oil mixture over the top of the tomatoes, then sprinkle with the breadcrumbs. 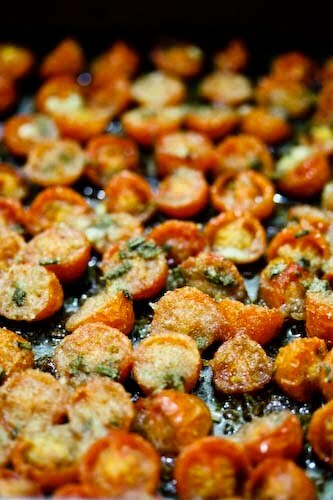 Bake the tomatoes until the olive oil is golden and the breadcrumbs browned. About 1 hour. Dig in. Interesting use of a minimal ingredients. I wonder how well this would play as a starter with rack of lamb. 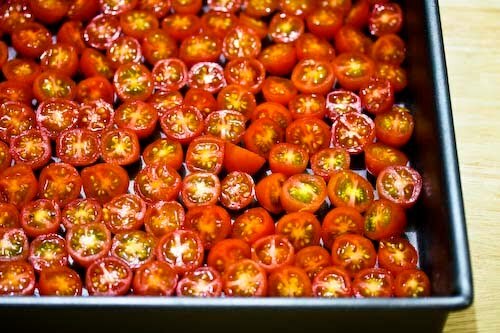 I admit, I've caved and roasted cherry tomatoes in the winter, too. These look great.. I love cherry tomatoes and being in Texas we normally have a nice selection year round! These are simple and healthy, I will be making them soon. I hope I can find some nice and good looking tomatoes in the market today so that I can try some of this. These look increidble. That bright pop of color will brighten up any winter day. It looks delicious. And easy to cook. I admit it's really cute and so tempting.